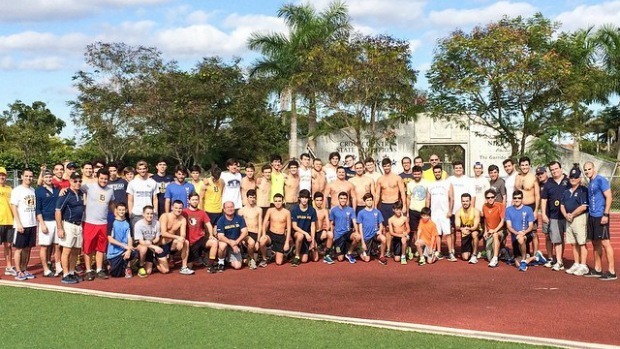 Over forty-five former Belen Jesuit runners came out to the school's cross country course for the annual Glory Mile. Paco Ruiz, class of 1973 and the father of current coach Frankie Ruiz, was the oldest of the former Wolverines to come out. While his son won his age group, it was class of 2014's Michael Magoulas who won the overall title in a time of 4:58. The idea for the event came from Juan Rodriguez (class of 1979) and former coach, Carlos Barquin who has been at the school since 1968. The first year of the event, they ran three miles, but realized that was a mistake since most of the alumni couldn't finish. They then went to two miles and the same issue persisted, so they finally settled on one mile. For Victor Arrietta (c/o 1995), who serves as the middle school cross country coach and varsity assistant the event was a great time. "I just love seeing all the old guys come back to the school." Frankie Ruiz (front left) echoes that sentiment and says the annual gathering is probably the best snapshot of why they are humbly proud of the program. Over 44 years of graduates get together once a season in front of the existing team and simply show them what it really means to be connected by something so primal as running. We are proud of what these guys accomplish as runners but we are most satisfied by what they do after their high school and collegiate running careers are over." Many of the former runners, Ruiz included, have gone onto become significant contributors in their community and have inspired those come after them to strive to be faster and better beyond the cross country course. It's a statement that means more to him than the the trophies they've earned. "At the end of the day all the state championships put together don't equal the feeling of seeing so many cross country alumni sharing a few hours with each other at the end of every season. Much of the importance of the PR's, meet scores, and trophies get blurry with time but the memories that are harder to forget are the ones off the race course at gatherings such as todays."